Savory cheesecakes are a wonderful thing so if you haven’t tried one, maybe this can be the first. 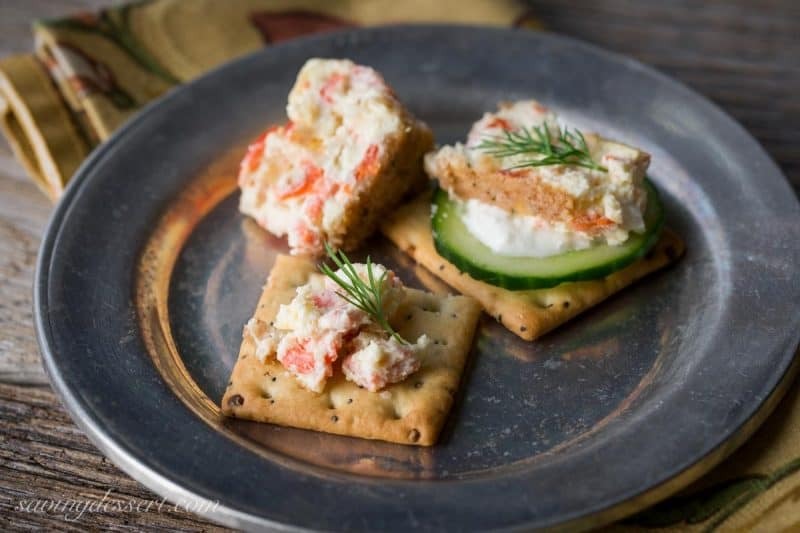 Cream cheese and quality wild-caught smoked salmon combine for a fantastic appetizer that is easy to make and sure to impress. Are you entertaining for New Year’s Eve? 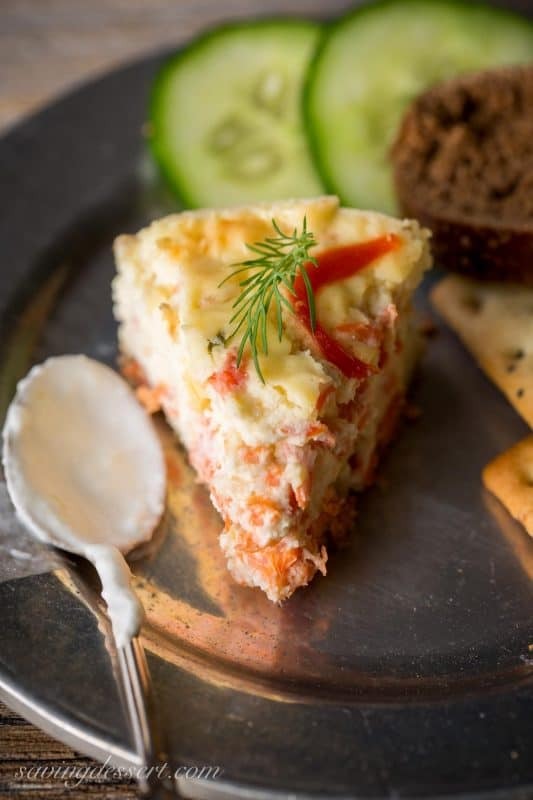 Whether you’ve invited a crowd or just a few favorite family members, your guests will love this make-ahead rich and tasty Savory Smoked Salmon Cheesecake with Horseradish-Lime Cream. This recipe makes two small cheesecakes using 4-inch mini-springform pans. 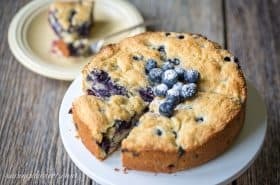 Triple the recipe and add 20 minutes to the baking time and you can have an 8″ or 9″ regular size savory cheesecake enough to serve a crowd. We loved it served on crackers, bread or sliced cucumber. Honestly I could just eat it with a fork and be a happy girl. Be sure to garnish with fresh dill if you can, it compliments the salmon especially well. A simple crust is made from crushed whole wheat crackers combined with a little grated Gruyere cheese and butter. Easy peasy! Lightly butter two mini-springform pans (4-inch diameter). Wrap the bottom and sides of each pan tightly in several layers of aluminum foil and set aside. 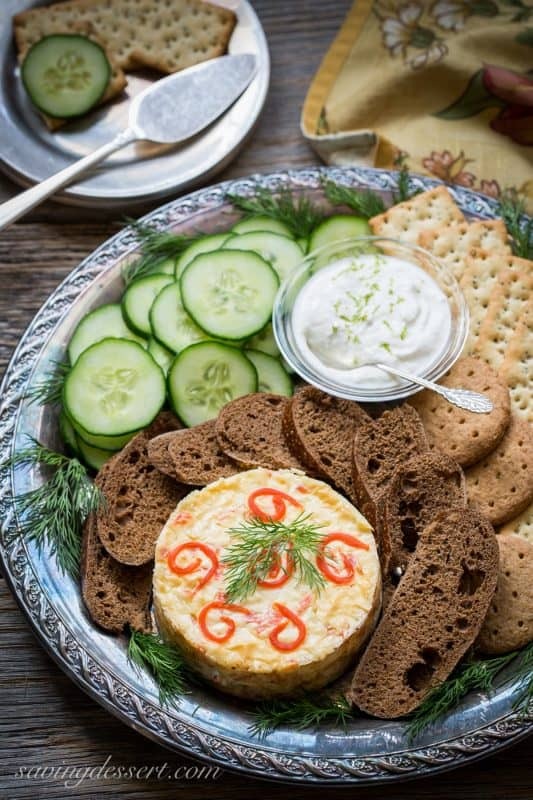 Combine the crushed crackers, 1 tablespoon of the Gruyere cheese and dill. Stir to combine then divide between the two prepared pans. Turn the pan to coat the sides and bottom evenly. Chill while preparing the filling. In a small saucepan (with a tight lid) melt the 2 teaspoons butter on low heat. Add the minced white onion and cover with the lid. Cook, stirring occasionally for about 10 minutes. Set aside to cool. Coarsely chop the smoked salmon and cut several thin strips for topping if desired. Set aside. In a food processor pulse the cream cheese until smooth. Add the egg, remaining 3 tablespoons Gruyere, salt and sour cream. Process until smooth. Remove the mixture to a small mixing bowl. Gently stir in the cooked onion, sliced green onion and chopped salmon. Divide the cream cheese mixture between the two prepared pans. Smooth the top and garnish with the thin strips of salmon if using. Set the mini-springform pans in a larger roasting pan or casserole dish. Fill the pan with enough water to come halfway up the sides of the springform pans. Bake for 1 hour or until the center is set. 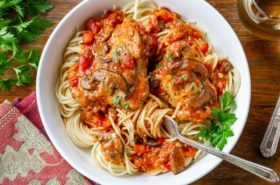 Turn off the oven and cool with the door ajar for 1 hour. Remove the springform pans to a rack to cool completely. Remove the foil and sides of the pans. Store in an airtight container until ready to serve. Bring to room temperature before serving. Garnish with fresh dill if desired. To make the Horseradish-Lime Cream combine the sour cream, horseradish, salt, lime zest and lime juice. Blend well. 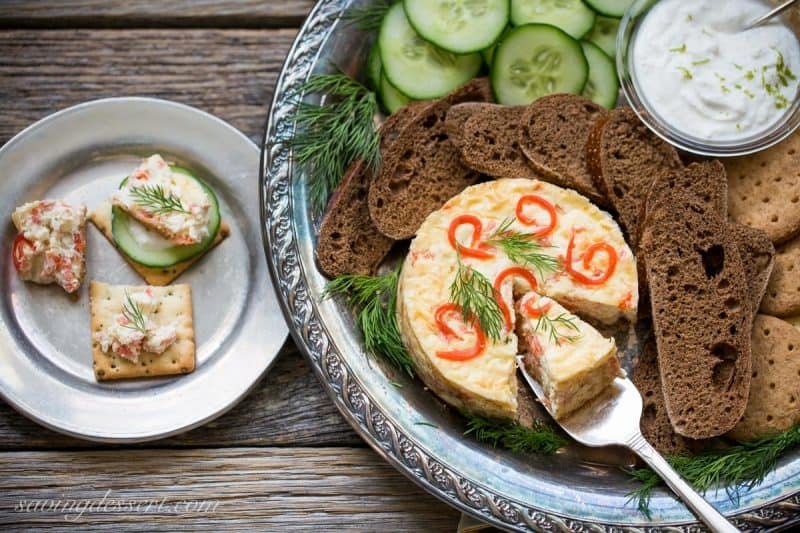 Serve with Horseradish Lime Cream, cucumbers, sliced hearty bread or crackers. Made be made 1 day ahead. Christmas arrived like a freight train and just like that, it’s over. We had a blast with our grandson Isaac as he was really into it this year and helped open all my presents. Each time he unwrapped a gift he would exclaim “it’s a box!” We are truly blessed to have our children close by and be able to enjoy the holidays together. I’m also pretty excited the holiday baking is over. I’m ready for salads and soup and maybe some more smoked salmon. I just love this stuff! Do you have big plans for New Year’s Eve? We don’t usually go out but we are this year. Should be fun! Hope you’ve recovered from the holiday frenzy and that you enjoy the last week of 2015! Thanks so much for stopping by! 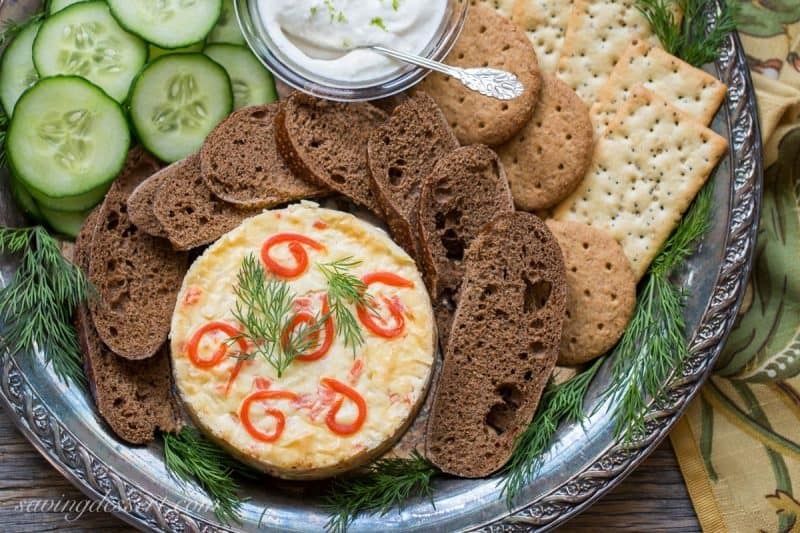 Smoked Salmon & Cucumber Cream Cheese Appetizers Crunchy Crackers Hot Spinach and Artichoke Dip Greek Layered Hummus Dip Recipe The Game Day Edition – Appetizers and Dessert! Next Post: 2015 – Top 10 favorites! Hi Tricia, I could get in trouble with this one, beautiful presentation. Our granddaughter is 2 now and she meticuliously opened everyone of her presents, what fun we had. Yummy too Cheri! Sounds like fun and I can’t believe she opened them slowly and carefully. How sweet! What a delicious idea! Have a Happy New Year Tricia! Thank you ladies 🙂 Hope you’re having a Happy New Year with friends and family! What a delicious idea! And love the easy peasy factor! Have a Happy New Year! We just love smoked salmon and easy works too 🙂 Happy New Year! There’s something about smoked fish that means holidays and New Years to me, Tricia. I think it’s because my family always had smoked fish of some sort or herring during the holidays. 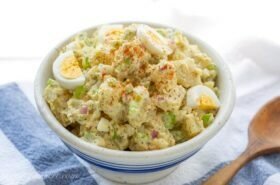 I’d love to celebrate the coming of the new year with this lovely appetizer! I love those family traditions and the memories food can bring 🙂 Happy New Year to you and your family! Thanks for stopping by Melanie – we enjoyed it very much and my husband has asked at least three times since, when are we going to have it again! Have a very Happy New Year! Beautifully done! Not only does it look beautiful, but it sounds amazing! Happy New Year! Oh my, this is totally new to me. I love it! Also, wonderful staging of your photos, very enticing. Thank you Amy. We just adore smoked salmon and it is perfect with cream cheese anyway 🙂 Happy New Year! Have fun on New Year’s. We stay in and I cook and I drink and I will probably be eating this! It looks great! Smoked Salmon is one fish that I like, Tricia. I think this looks WONDERFUL!! YUUUUMMMY!!!!!!!!!!! 😉 AND SO PRETTY!!!! It DOES sound like you had a WONDERFUL CHRISTMAS with your family!!! Kids just add SO MUCH FUN to Christmas!!! HOPE you stay safe & have a SUPER NEW YEAR!!!! We’ll be here watching to see what recipes you come up with for us!!! 😉 HAPPY NEW YEAR!!! We love it Becky – and if you do to then this is for you! Happy New Year!!! I have some smoked salmon in the fridge I’m planning to use for New Year’s breakfast! 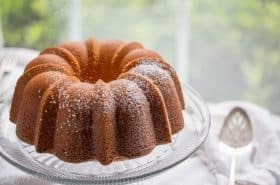 What a great recipe this is and a wonderful idea. Your platter just looks so welcoming. : ) Hope you had a wonderful Christmas…it was so nice here at our end, and we’re enjoying the rest of our break. We can’t get enough of smoked salmon for breakfast or anytime. Glad you had a lovely Christmas – enjoy your break and have a very Happy New Year! I miss smoked salmon cheesecake, Tricia. This looks really gorgeous and I love your plating and presentation. We miss smoked salmon and seem to go months and months before picking up a package for a nice splurge. Honestly I can eat it plain on a cracker and be happy. Have a very happy New Year! I’d love to be at your house for New Years Eve Tricia. This is gorgeous and sounds just amazing! Love the horseradish sauce, what a delightful combination of flavors. We did have a lovely Christmas Betty – hope you did too 🙂 Miss your posts! I can just taste this now, your photos are so evocative, as always! 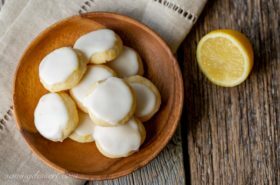 That horseradish lime cream sounds fantastic! Thank you Sue! 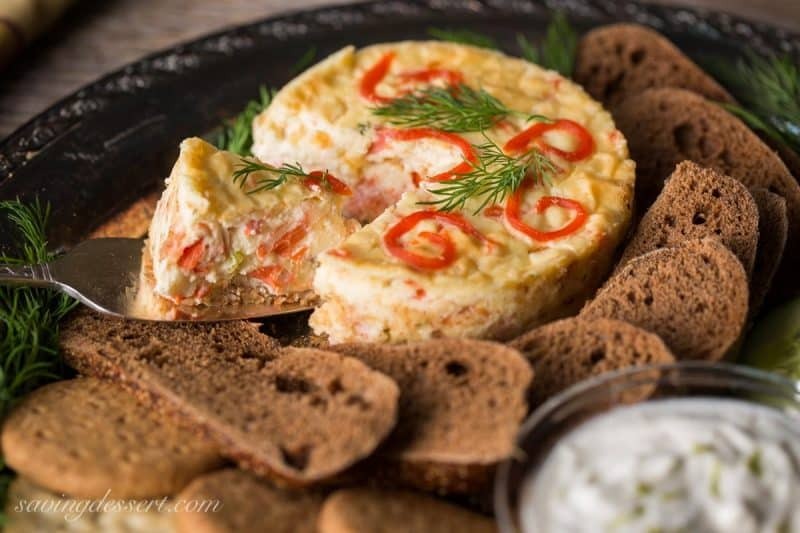 As you know, a savory cheesecake loaded with smoked salmon is a great treat 🙂 Have a wonderful week! I just LOVE everything about this, what a delicious appetizer.